"Ti plant" redirects here. It is not to be confused with tea plant. Cordyline fruticosa is an evergreen flowering plant in the family Asparagaceae. The plant is of great cultural importance to the traditional animistic religions of Austronesian and Papuan peoples of the Pacific Islands, New Zealand, Island Southeast Asia, and Papua New Guinea. It is also cultivated for food, traditional medicine, and as an ornamental for its variously colored leaves. It is identified by a wide variety of common names, including ti plant, palm lily, cabbage palm, and good luck plant. The reconstructed Proto-Malayo-Polynesian word for ti is *siRi. Cognates include Malagasy síly; Palauan sis; Ere and Kuruti siy; Araki jihi; Arosi diri; Chuukese tii-n; Wuvulu si or ti; Tongan sī; Samoan, Tahitian, and Māori tī; and Hawaiian kī. The names in some languages have also been applied to the garden crotons (Codiaeum variegatum), which similarly have red or yellow leaves. The cognates of Proto-Western-Malayo-Polynesian *sabaqaŋ, similarly, have been applied to both garden crotons and ti plants. In the Philippines, they are also known by names derived from the Proto-Austronesian *kilala, "to know", due to its use in divination rituals. Cognates derived from that usage include Tagalog sagilala; and Visayan and Bikol kilála or kilaa. In New Zealand, the terms for ti were also transferred to the native and closely related cabbage tree (Cordyline australis), as tī kōuka. Cordyline fruticosa was formerly listed as part of the families Agavaceae and Laxmanniaceae (now both subfamilies of the Asparagaceae in the APG III system). Ti is a palm-like plant growing up to 3 to 4 m (9.8 to 13.1 ft) tall with an attractive fan-like and spirally arranged cluster of broadly elongated leaves at the tip of the slender trunk. It has numerous color variations, ranging from plants with red leaves to green and variegated forms. It is a woody plant with leaves 30–60 cm (12–24 in) (rarely 75 cm or 30 in) long and 5–10-centimetre (2.0–3.9 in) wide at the top of a woody stem. It produces 40–60-centimetre (16–24 in) long panicles of small scented yellowish to red flowers that mature into red berries. Its original native distribution is unknown, but it is believed to be native to the region from Bangladesh, to Mainland Southeast Asia, South China, Taiwan, Island Southeast Asia, New Guinea, and Northern Australia. It has the highest morphological diversity in New Guinea and is believed to have been extensively cultivated there. It was carried throughout Oceania by Austronesians, reaching as far as Hawaii, Aotearoa (New Zealand), Rangitāhua (Kermadec Islands), and Rapa Nui at their furthest extent. A particularly important type of ti in eastern Polynesia is a large green-leafed cultivar grown for their enlarged edible rhizomes. Unlike the ti populations in Southeast Asia and Near Oceania, this cultivar is almost entirely sterile in the further islands of eastern Polynesia. It can only be propagated by cuttings from the stalks or the rhizomes. It is speculated that this was the result of deliberate artificial selection, probably because they produce larger and less fibrous rhizomes more suitable for use as food. Ti has many uses but it is most notable as one of the most important plants related to the indigenous animist religions of Austronesians. It is very widely regarded as having mystical or spiritual powers in various Austronesian (as well as Papuan) cultures. Among a lot of ethnic groups in Austronesia it is regarded as sacred. Common features include the belief that they can hold souls and thus are useful in healing "soul loss" illnesses and in exorcising against malevolent spirits, their use in ritual attire and ornamentation, and their use as boundary markers. Red and green cultivars also commonly represented dualistic aspects of culture and religion and are used differently in rituals. Red ti plants commonly symbolize blood, war, and the ties between the living and the dead; while green ti plants commonly symbolize peace and healing. They are also widely used for traditional medicine, dye, and ornamentation throughout Austronesia and New Guinea. Their ritual uses in Island Southeast Asia have largely been obscured by the introduction of Hinduism, Buddhism, Islamic, and Christian religions, but they still persist in certain areas or are coopted for the rituals of the new religions. In Philippine anitism, ti were commonly used by babaylan (female shamans) when conducting mediumship or healing rituals. A common belief in Filipino cultures is that the plant has the innate ability to host spirits. Among the Ifugao people of Northern Luzon, it is planted around terraces and communities to drive away evil spirits as well as mark boundaries of cultivated fields. The red leaves are believed to be attractive to spirits and is worn during important rituals as part of the headdresses and tucked into armbands. In the past, it was also worn during ceremonial dances called bangibang, which was performed by both men and women for warriors who died in battle or through violent means. They are also used to decorate ritual objects. Among the Palaw'an people, it is planted in burial grounds to prevent the dead from becoming malevolent spirits. In Indonesia, red ti are used similarly as in the Philippines. Among the Dayak, Sundanese, Kayan, Kenyah, Berawan, Iban and Mongondow people, red ti are used as wards against evil spirits and as boundary markers. They are also used in rituals like in healing and funerals and are very commonly planted in sacred groves and around shrines. The Dayak also extract a natural green dye from ti. During healing rituals of the Mentawai people, the life-giving spirit are enticed with songs and offerings to enter ti stems which are then reconciled with the sick person. Among the Sasak people, green ti leaves are used as part of the offerings to spirits by the belian shamans. Among the Baduy people, green ti represent the body, while red ti represent the soul. Both are used in rice planting rituals. They are also planted on burial grounds. Among the Balinese and Karo people, ti plants are planted near village or family shrines in a sacred grove. Among the Toraja people, red ti plants are used in rituals and as decorations of ritual objects. They are believed to occur in both the material and the spirit worlds (a common belief in Austronesian animism). In the spirit world, they exist as fins and tails of spirits. In the material world, they are most useful as guides used to attract the attentions of spirits. The red leaves are also symbolic of blood and thus of life and vitality. Among the Ngaju people, ti plants were symbolic of the sacred groves of ancestors. They were also important in ritual promises dedicated to high gods. They were regarded as symbolic of the masculine "Tree of Life", in a dichotomy against Ficus species which symbolize the feminine "Tree of the Dead". 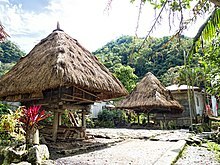 In New Guinea, ti are commonly planted to indicate land ownership for cultivation and are also planted around ceremonial men's houses. They are also used in various rituals and are commonly associated with blood and warfare. Among the Tsembaga Maring people, they are believed to house "red spirits" (spirits of men who died in battle). Prior to a highly ritualized (but lethal) warfare over land ownership, they are uprooted and pigs are sacrificed to the spirits. After the hostilities, they are re-planted in the new land boundaries depending on the outcome of the fight. The men involved ritually place their souls into the plants. The ritual warfare have been suppressed by the Papua New Guinea government, but parts of the rituals still survive. Among the Ankave people, red ti is part of their creation myth, believed as having arisen from the site of the first murder. Among the Mendi and Sulka people they are made into dyes used as body paint, and their leaves are used for body adornments and purification rituals. Among the Nikgini people, the leaves have magical abilities to bring good luck and are used in divination and in decorating ritual objects. Among the Kapauku people, ti plants are regarded as magical plants and are believed to be spiritual beings themselves. Unlike other magical plants which are controlled by other spirits, ti plants had their own spirits and are powerful enough to command other spiritual beings. Red plants are used in white magic rituals, while green plants are used in black magic rituals. They are also commonly used in protection and warding rituals. Among the Baktaman people, red plants are used for initiation rites, while green plants are used for healing. The Ok-speaking peoples also regard ti plants as their collective totem. In Island Melanesia, ti are regarded as sacred by various Austronesian-speaking peoples and are used in rituals for protection, divination, and fertility. Among the Kwaio people, red ti are associated with feuding and vengeance, while green ti are associated with ancestor spirits, markers of sacred groves, and wards against evil. The Kwaio cultivate these varieties around their communities. Among the Maenge people of New Britain, ti leaves are worn as everyday skirts by women. The color and size of leaves can vary by personal preference and fashion. New cultivars with different colors are traded regularly and strands of ti are grown near the village. Red leaves can only worn by women past puberty. Ti is also the most important plant in magic and healing rituals of the Maenge. Some ti cultivars are associated with supernatural spirits and have names and folklore around them. In Vanuatu, Cordyline leaves, known locally by the Bislama name nanggaria, are worn tucked into a belt in traditional dances like Māʻuluʻulu, with different varieties having particular symbolic meanings. Cordylines are often planted outside nakamal buildings. In Fiji, red ti leaves are used as skirts for dancers and are used in rituals dedicated to the spirits of the dead. They are also planted around ceremonial buildings used for initiation rituals. In Micronesia, ti leaves are buried under newly built houses in Pohnpei to ward of malign sorcery. In instances of an unknown death, shamans in Micronesia communicate with the dead spirit through ti plants, naming various causes of death until the plant trembles. There is also archaeological evidence that the rhizomes of the plants were eaten in the past in Guam prior to the Latte Period. In Polynesia, green ti were cultivated widely for food and religious purposes. They are commonly planted around homes, in sacred places (including marae and heiau), and in grave sites. The leaves are also carried as a charm when traveling and the leaves are used in rituals that communicate with the species. Like in Southeast Asia, they are widely believed to protect against evil spirits and bad luck; as well as having the ability to host spirits of dead people, as well as nature spirits. In ancient Hawaiʻi the plant was thought to have great spiritual power; only kahuna (shamans) and aliʻi (chiefs) were able to wear leaves around their necks during certain ritual activities. Ti was sacred to the god of fertility and agriculture Lono, and the goddess of the forest and the hula dance, Laka. Ti leaves were also used to make lei, and to outline borders between properties it was also planted at the corners of the home to keep evil spirits away. To this day some Hawaiians plant tī near their houses to bring good luck. The leaves are also used for lava sledding. A number of leaves are lashed together and people ride down hills on them. The leaves were also used to make items of clothing including skirts worn in dance performances. The Hawaiian hula skirt is a dense skirt with an opaque layer of at least fifty green leaves and the bottom (top of the leaves) shaved flat. The Tongan dance dress, the sisi, is an apron of about 20 leaves, worn over a tupenu, and decorated with some yellow or red leaves. In Aotearoa, certain place names are derived from the use and folklore of ti, like Puketī Forest and Temuka. The ti plants in Kaingaroa are known as nga tī whakāwe o Kaingaroa ("the phantom trees of Kaingaroa"), based on the legend of two women who were turned into ti plants and seemingly follow people traveling through the area. They are also widely used for traditional medicine, dye, and ornamentation throughout Austronesia and New Guinea. In Polynesia, the leaves of the green-leafed form are used to wrap food, line earth ovens and fermentation pits of breadfruit, and their rhizomes harvested and processed into a sweet molasses-like pulp eaten like candy or used to produce a honey-like liquid used in various sweet treats. In Hawaii, the roots are also be mixed with water and fermented into an alcoholic beverage known as okolehao. Fibers extracted from leaves are also used in cordage and in making bird traps. The consumption of ti as food, regarded as a sacred plant and thus was originally taboo, is believed to have been a daring innovation of Polynesian cultures as a response to famine conditions. The lifting of the taboo is believed to be tied to the development of the firewalking ritual. Ti is a popular ornamental plant, with numerous cultivars available, many of them selected for green or reddish or purple foliage. Okolehao, a liquor made from ti roots. ^ "Cordyline fruticosa". Germplasm Resources Information Network (GRIN). Agricultural Research Service (ARS), United States Department of Agriculture (USDA). Retrieved 2009-11-17. ^ a b c Blust, Robert; Trussel, Stephen (2013). "The Austronesian Comparative Dictionary: A Work in Progress". Oceanic Linguistics. 52 (2): 493–523. doi:10.1353/ol.2013.0016. ^ "*Tï". Te Mära Reo: The Language Garden. Benton Family Trust. Retrieved 15 January 2019. ^ a b c d Hinkle, Anya E. (May 2007). "Population structure of Pacific Cordyline fruticosa (Laxmanniaceae) with implications for human settlement of Polynesia". American Journal of Botany. 94 (5): 828–839. doi:10.3732/ajb.94.5.828. ^ Philip, Simpson (9 September 2012). "Cordyline fruticosa (ti plant)". Invasive Species Compendium. Centre for Agriculture and Bioscience International. Retrieved 19 January 2019. ^ a b c d Hinkle, Anya E. (2004). "The distribution of a male sterile form of ti (Cordyline fruticosa) in Polynesia: a case of human selection?" (PDF). The Journal of the Polynesian Society. 113 (3): 263–290. ^ Trisha, Borland (2009). "Cordyline fruticosa: the distribution and continuity of a sacred plant". UCB Moorea Class: Biology and Geomorphology of Tropical Islands (PDF). Student Research Papers, Fall 2009. University of California. ^ a b c d e f g h Ehrlich, Celia (2000). "'Inedible' to 'edible': Firewalking and the ti plant [Cordyline fruticosa (L.) A. Chev.]". The Journal of the Polynesian Society. 109 (4): 371–400. ^ Ehrlich, Celia (1989). "Special problems in an ethnobotanical literature search: Cordyline terminalis (L.) Kunth, the "Hawaiian ti plant"" (PDF). Journal of Ethnobiology. 9 (1): 51–63. ^ a b Rappaport, Roy A. (1989). Pigs for the Ancestors: Ritual in the Ecology of a New Guinea People, Second Edition. Waveland Press. pp. 19, 125, 231. ISBN 9781478610021. ^ a b Lense, Obed (1 April 2012). "The wild plants used as traditional medicines by indigenous people of Manokwari, West Papua". Biodiversitas, Journal of Biological Diversity. 13 (2): 98–106. doi:10.13057/biodiv/d130208. ^ a b Dahlia, Andi Amalia; Aktsar, Roskiana Ahmad; Wahid, Milhawati (2013). "Extraction of color pigment and determination of flavonoid content of andong leaves (Cordyline fruticosa) source Makassar City". Journal of Biological & Scientific Opinion. 1 (4). ^ van Schooneveld, Inge (18 July 2018). "Punnuk rice harvest ritual celebrates the Earth's abundance". Sinchi. Retrieved 19 January 2019. ^ de Guzman, Daniel (6 July 2018). "Flora De Filipinas: A Short Overview of Philippine Plant Lore". The Aswang Project. Retrieved 19 January 2019. ^ Harvest Rituals in Hapao (PDF). Social Practices, Rituals and Festive Events. International Information and Networking Centre for Intangible Cultural Heritage in the Asia-Pacific Region under the auspices of UNESCO (ICHCAP). ^ Balangcod, T.D. ; Balangcod, A.K. (January 2009). "Underutilized Plant Resources in Tinoc, Ifugao, Cordillera Administrative Region, Luzon Island, Philippines". Acta Horticulturae (806): 647–654. doi:10.17660/ActaHortic.2009.806.80. ^ Novellino, Dario (2001). "Palawan Attitudes Toward Illness" (PDF). Philippine Studies. 49 (1): 78–93. ^ Gunawan (2013). "Study Ethnobotany Andong Plants of the Genus Cordyline in the Dayaknese of Meratus Lok Lahung Village, Loksado, South Borneo". 4th International Conference on Global Resource Conservation & 10th Indonesian Society for Plant Taxonomy Congress. Brawijaya University. ^ a b Rahayu, Mulyati; Rustiami, Himmah; Rugayah (2016). "Ethnobotanical Study of Sasak Ethnic, East Lombok, West Nusa Tenggara" (PDF). Journal of Tropical Biology and Conservation: 85–99. ^ Loeb, E.M. (1929). "Shaman and Seer". American Anthropologist. 31 (1): 60–84. ^ Hakim, Nurul (2006). Cultural and Spiritual Values of Forests in Bady Region, Banten, Indonesia. MSc Forest and Nature Conservation Policy. Wageningen University. ^ Iskandar, Johan; Iskandar, Budiawati S. (15 March 2017). "Various Plants of Traditional Rituals: Ethnobotanical Research Among The Baduy Community". Biosaintifika: Journal of Biology & Biology Education. 9 (1): 114. doi:10.15294/biosaintifika.v9i1.8117. ^ Domenig, Gaudenz (2014). Hoefte, Rosemarijn; Nordholt, Henk Schulte (eds.). Religion and Architecture in Premodern Indonesia: Studies in Spatial Anthropology. Verhandelingen van het Koninklijk Instituut voor Taal-, Land- en Volkenkunde. 294. BRILL. p. 74. ISBN 9789004274075. ^ Sumantera, I. Wayan (1999). "Plants Intertwined with Culture". Roots. 1 (19). ^ Nooy-Palm, Hetty (1979). The Sa’dan-Toraja: A Study of Their Social Life and Religion. Verhandelingen van het Koninklijk Instituut voor Taal-, Land- en Volkenkunde. 87. Springer. p. 225. ISBN 9789401771504. ^ Volkman, Toby Alice (1985). Feasts of Honor: Ritual and Change in the Toraja Highlands. Illinois studies in anthropology. 16. University of Illinois Press. ISBN 9780252011832. ^ Fox, James J. (2006). Inside Austronesian Houses: Perspectives on Domestic Designs for Living. ANU E Press. p. 21. ISBN 9781920942847. ^ a b Sheridan, Michael (1 January 2016). "Boundary Plants, the Social Production of Space, and Vegetative Agency in Agrarian Societies". Environment and Society. 7 (1). doi:10.3167/ares.2016.070103. ^ West, Paige (2006). Conservation Is Our Government Now: The Politics of Ecology in Papua New Guinea. Duke University Press. p. 22. ISBN 9780822388067. ^ Morris, Brian (2006). Religion and Anthropology: A Critical Introduction. Cambridge University Press. p. 249. ISBN 9780521852418. ^ Rappaport, Roy A. (1967). "Ritual Regulation of Environmental Relations among a New Guinea People". Ethnology. 6 (1): 17–30. ^ Bonnemère, Pascale (March 2018). "Actions, Relations and Transformations: The Cycle of Life According to the Ankave of Papua New Guinea". Oceania. 88 (1): 41–54. doi:10.1002/ocea.5180. ^ Hill, Rowena Catherine (2011). Colour and Ceremony: the role of paints among the Mendi and Sulka peoples of Papua New Guinea (MSc). Durham University. ^ Nombo, Porer; Leach, James (2010). "Reite Plants: An Ethnobotanical Study in Tok Pisin and English". Asia-Pacific Environment Monograph (PDF). 4. ANU E Press. ISBN 9781921666018. ^ Keesing, Roger M. (September 2012). "On not understanding symbols". HAU: Journal of Ethnographic Theory. 2 (2): 406–430. doi:10.14318/hau2.2.023. ^ Panoff, Françoise (2018). Barbira-Freedman, Françoise (ed.). Maenge Gardens: A study of Maenge relationship to domesticates. pacific-credo Publications. doi:10.4000/books.pacific.690. ISBN 9782956398189. ^ Gray, Andrew (2012). The Languages of Pentecost Island. Manples (BFoV) Publishing. ISBN 9780956098542. ^ Moore, Darlene R. (2005). "Archaeological Evidence of a Prehistoric Farming Technique on Guam" (PDF). Micronesica. 38 (1): 93–120. ^ a b c d Simpson, Philip (1 January 1997). "Are Cabbage Trees Worth Anything? Relating Ecological and Human Values in the Cabbage Tree, tī kōuka". The Journal of New Zealand Studies. 7 (1). doi:10.26686/jnzs.v7i1.395. ^ Kawate, M.; Uchida, J.; Coughlin, J.; Melzer, M.; Kadooka, C.; Kam, J.; Sugano, J.; Fukuda, S. (2014). "Ti Leaf (Cordyline terminalis or fruticosa) Diseases in Hawaii's Commercial Orchards" (PDF). HānaiʻAi/The Food Provider: 1–11. ^ Gamayo, Darde (4 August 2016). "Ti Leaf: Canoe Plant of Ancient Hawai'i". Big Island Now. Retrieved 21 January 2019. ^ Da Silva, Alexandre (24 July 2005). "Thrill ride". Star Bulletin. Retrieved 21 January 2019. ^ Lanier, Clint (10 November 2016). "Okolehao, the Sweet Hawaiian Moonshine With an Unsavory Past". Eater. Retrieved 21 January 2019. ^ Griffith, Robert Eglesfeld (1847). Medical Botany. Lea and Blanchard. p. 655. Wikimedia Commons has media related to Cordyline fruticosa.